Last year marked 50 years of diplomatic relations between Germany and Israel. To celebrate this milestone, events took place everywhere. The Canadian West Coast was no exception. The Centre for Israel and Jewish Affairs, Pacific Region, was approached by the German Consulate in Vancouver to plan the celebrations locally. I had the privilege of working with a fantastic team at the consulate. I was impressed by the fact that everyone, from the consul general himself to the person that welcomes visitors, was involved. Among other activities, we held a concert by operatic soprano Johanna Krumin and pianist Markus Zugehör performing pieces by Jewish and non-Jewish German composers. Following months of hard work, it was not only a memorable celebration with the German and Jewish communities but also a strong relationship that led the consul general in Vancouver, Josef Beck, to invite me to participate in the program Jewish Life in Germany – Past, Present and Future. Put together by the Federal Foreign Office and the Goethe Institute, the fall program packed eight days of nonstop activities that allowed North American Jewish professionals and lay leaders to visit Germany and explore both the current reality of Jewish German life, as well as the Israel-Germany relationship. My experiences on this trip could fill several pages so I will share just a few that left a special impression on me. 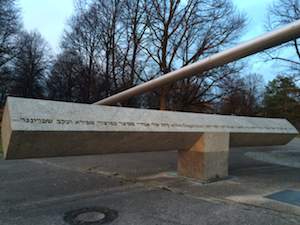 We began with a visit to Berlin’s historic Jewish Quarter, on the trail of Moses Mendelssohn. We visited the site of the first synagogue, the Centrum Judaicum, the old Jewish cemetery, the Jewish high school and the house of the world’s first female rabbi, Regina Jonas, ordained during the Nazi regime in 1935. Hers is a little-known and fascinating story that would be an inspiration for every Jewish woman (and man). Following the theme of female leadership, we sat with Deidre Berger, managing director of the American Jewish Committee in Berlin to discuss their work lobbying the government on issues that affect the Jewish community and Israel, such as the European Union’s newly adopted guidelines for labeling goods from Israel’s disputed territories, combating the boycott, divestment and sanction movement, and antisemitism. 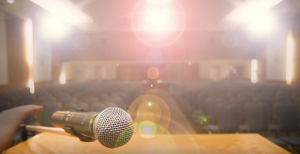 Their work doesn’t stop there: they are actively engaged in Jewish interfaith dialogue, particularly with the Turkish community, and they work closely with the government helping develop civic education curricula in schools. The next day, we moved to the subject of anti-terrorism at the Federal Ministry of the Interior, where we spoke with Richard Reinfeld, head of Division ÖS II 3, the office of terrorism and extremism by foreigners. Among other topics, we heard about the great cooperation between Israel and Germany in terms of intelligence exchange. After the imperative, behind-the-scenes visit to the Jewish Museum of Berlin, the Memorial to the Murdered Jews of Europe and the Topography of Terror Foundation, we had the opportunity to meet with Gerhard Friedrich Schlaudraff, head of the Near East division of the Federal Foreign Office, which covers Israel and all its neighbors. It was frustrating to confirm something that we all know: while there is always someone on the Israeli front to be held accountable for negotiations with the Palestinian Authority, no reliable partner can be found on the PA side. We left Berlin after meeting with some of the many Israelis that continue to move to the city. More than 18,000 Israelis have made Berlin their home. Listening to their stories got me thinking about our homeland. Many leave Israel, we were told, because it has become hard to stay, a situation they described with words like “incredibly expensive,” “stressful,” “constant anxiety” and “hopelessness.” I still have mixed feelings about this. While I’m happy they are able to live in a situation that is better for them, I think about the irony: the very place where, years ago, life became absolutely unsustainable for Jews has today become a safe haven of sorts for many. Our next stop was Munich, where we met with some outstanding people. Listening to Janne Weinzierl from the Stolpersteine Initiative was uplifting. 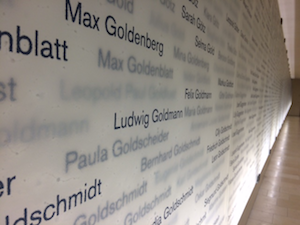 This initiative is a whole topic on its own, but, for now, I will just say that this woman and her husband, neither of whom is Jewish, have volunteered tirelessly to keep the memory of thousands of Jews, and other minorities across Europe murdered during the Nazi regime, alive with a simple “stumbling stone.” To learn more, visit stolpersteine.eu/en/home. From Dr. Charlotte Knobloch, we heard about the 200-year history of the Bavarian Jewish community and its 70th re-founding anniversary. Knobloch is a pillar of Jewish life in Munich, at 83 years old still actively working for the community. 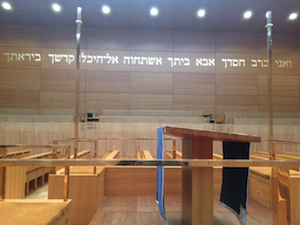 After a special and vibrant Shabbat service at Ohel Jakob synagogue, we headed to Dachau. Can you imagine how it felt after walking to shul to gather with another 300 or so Jews – including some survivors – in the middle of the city, praying the same prayers and singing the same songs that we have sung for hundreds of years (at least) and then proceeding to the sombre and moving visit to a concentration camp? The entire trip, in fact, was so intense that, most nights, I could not sleep. There was so much to think about at the end of every day. We had sad moments, including our visit to the memorial for the victims of the 1972 terrorist attack on the Israeli Olympic team, and amazing, positive experiences that no one in the group will forget. I rediscovered Germany on this trip, saw it as never before and, like many mission participants visiting Israel on CIJA trips, I changed many of my opinions about the country – one that marked our people in a very profound and complex way. It is evident that there is still antisemitism in German society, though definitely not more than in other European countries. I also perceived ambiguity in some of our meetings with German government officials, especially with regard to Israel, but don’t get me wrong, I could see that Germany is one of Israel’s strongest and closest partners today. It is also clear that Germany has completely changed for the better in relation to our community – not only acknowledging a heavy responsibility for the past but also honestly seeking to create a better future by supporting, protecting and fostering Jewish life and by educating the new generations against antisemitism and hatred. This is important for us both as Jews and as advocates of justice and tikkun olam. Yael Levin is manager, community relations, at the Centre for Israel and Jewish Affairs, Pacific Region. This article was originally published by CIJA’s The Exchange. Next Next post: Are good intentions enough?